I was looking for suitable Calico cat pictures in Flickr when I stumbled across one of the most popular tags which happened to be “say no to videos in Flickr”. I can see why. To be honest, I don’t really need to use the service for videos. Although they do seem to be good quality, and I don’t mind the time limit, I have had problems playing every video I have tried. Hence, I have given up. I do have a very good connection. Anyway, thought it was interesting to see a lot of strong feeling against the development. 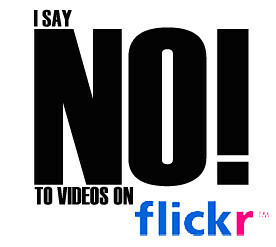 This entry was posted in Flickr, protest, video and tagged campaign, Flickr, protest, saynotovideoonflickr, video. Bookmark the permalink.